If you want to kill somebody, this is the wrong article. We’re actually going to discuss the opposite: helping somebody live— healthier and better. That person is you! In the process, we’re going to show you a few things you can get away with while keeping good health. First of all, let’s just get the monetary factor out of the way. Water is cheaper than any other beverage. Enough said. You can get away with spending more money elsewhere if you become a water drinker. In fact, the next time you see somebody drinking water, go ahead and commend him on his prudence, then ask him about the fun things he can afford to buy as a water-man. Snack consumption outside of a regular meal continues to increase among Americans, accounting for more than 25 percent of calorie intake each day, according to research presented at the 2011 Institute of Food Technologists (IFT) Annual Meeting & Food Expo®. Don’t think this is all in food you eat. A major portion of the calories is just beverages. What this means is that you can get away with eating a lot more calories if you just switch your drink to water. Many beverages are harmfully acidic to your mouth and teeth. Water fights acid erosion by balancing the pH of your mouth and rinsing away the acids. So, of course, if you switch to water, you will have less erosion, but in addition, you can get away with drinking your preferred acidic drinks if you’ll just rinse with water immediately afterwards. It’s an easy and powerful preventive measure against serious oral problems, including periodontal disease. For all you caffeine junkies, you need to know, drinks with caffeine dehydrate you. The antithesis of dehydration is water. The H in H2O stands for hydrogen, from which the word “hydration” derived. The only thing more energizing than caffeine is staying hydrated, which is attained by drinking less caffeine and more water. Their coffees in hand, the guys at the office will be confused as they come your way with tired, dehydrated eyes watching you bouncing off the walls, fueled by cups of water. Water is the best liquid for your oral health, and it lets you get away with, well, we’ll just say, more! Commercial floss was first manufactured from silk in 1882, but what did we do before then? Chances are, lost more teeth. Today, we use a Gore-Tex material to floss our teeth. That is, when and if we in fact floss our teeth. The average amount of floss bought per person each year is 18 yards. Unfortunately, figuring one foot per day comes out to 122 yards per year. The math doesn’t even come close to adding up. People are simply not taking advantage of this vital element of preventive dental care that is today so readily available. 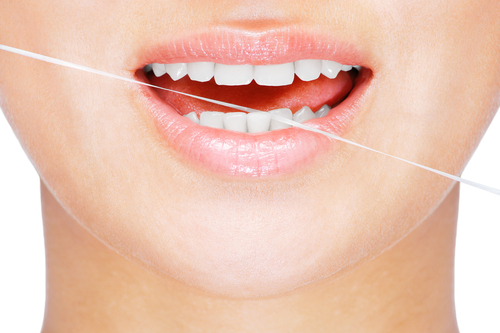 Only an estimated 28 percent of people say they floss daily. Flossing reduces the harmful bacteria in your mouth that feeds on food particles and other bacteria to create plaque at your gum line. The acid produced by the bacteria deteriorates tooth enamel and causes cavities. Additionally, volatile sulfur compounds made from the bacteria cause bad breath. Eventually if left un-flossed and hidden between your teeth, bacteria builds up tarter, which can only be removed by your dentist. At this point, you’re looking at gingivitis leading to periodontal disease. Incurable and detrimental to bone structure, this disease leads to more problems, time-consuming procedures, and spending. If you are guilty of not flossing correctly, enough, or even at all, weigh the risks you’re exposing yourself to. Is the risk of periodontal disease, tooth decay, and tooth loss a fair trade for not flossing? Dr. Jeffrey Allen and our team will examine your mouth at your next checkup to assess your flossing situation. We will address any developing problems we find, and discuss proper flossing techniques with you. As far as oral health priorities, flossing ranks equal to brushing. Mall Kiosks to Whiten Teeth: Do They Work? Between the clothing and shoe stores at the mall, the center walkway features stand alone, booth-like shops, typically attended by aggressive salesmen. These little shops without walls are called kiosks. Sometimes they sell sunglasses, jewelry, or ten-minute massages in funny little chairs. You might have noticed a kiosk with dental chairs. People sit in the chairs while a device lights up their mouths in a sort of radioactive-looking bluish glow. There might be a screen nearby advertising an instant teeth whitening product and featuring a beautiful model with a heavenly smile. When food and drinks prove to be too hot or too cold for your teeth but not for the rest of your mouth, then something is not right. If your teeth seem to suddenly develop their own nervous system, sending pain from the end of your tooth up to your gums, you may be suffering from tooth sensitivity (dentin hypersensitivity). Common sense may tell us that the harder we brush our teeth, the healthier we make them. Do you have a strong grip on the toothbrush while you aggressively jerk the bristles over your enamel? Whereas you may imagine that you are scrubbing away all the plaque, you might also be harming your gums. Brushing too hard can cause gum recession. You can literally brush away your gums. As your gums recede a little, the roots in your teeth are exposed. Your gums protect the roots. Therefore, when this happens you develop tooth sensitivity from the now unshielded nerves inside your roots. Allen Family Dentistry has some brushing recommendations for you. Be sure you’re brushing with a soft bristle toothbrush. Rolling, light strokes are the best movements. During your next checkup, you can be sure that Dr. Allen and his team will measure your gum recession, if any, check for other tooth sensitivity causes, and review preventive homecare techniques. To suggest that a nuclear family should live in separate locations rather than one home sounds ridiculous. A family lives together in one home. Not only is this preferred because it is more intimate, but it’s also just plain practical. More efficiency and interdependence is possible when you’re under one roof, not to mention a sense of homey comfort. So why is it supposedly a legitimate suggestion to take kids to a different dentist than the parents? There’s no rule that states children must see a pediatric dentist. A family lives in one home together. Attending the same general dentistry office together accomplishes similar efficiencies and comforts. This is the logic behind Allen Family Dentistry. Our dental office offers a range of services: preventive, restorative, cosmetic, general, and family dentistry. We gladly address emergency dentistry also. As an all-inclusive practice, Dr. Allen makes it possible to bring the whole family to one place, where a working knowledge and history of the family can be advantageous to your family’s overall healthcare. It only makes sense. Our team is trained to address dental problems in adults and children, and your whole family will feel right at home in our office. In fact, ranging from children all the way to seniors, our patients enjoy a caring, confident relationship with Dr. Allen and our team. 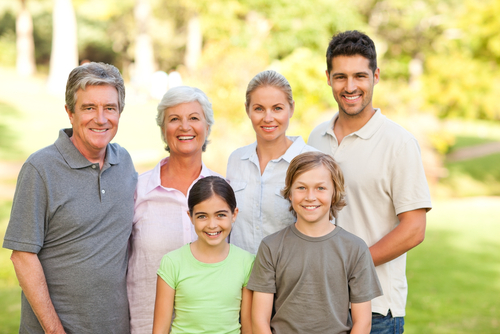 Keep your family under one dental practice’s roof. Our team at Allen Family Dentistry wants to show you how easy and comfortable going to the dentist can be — for your whole family. Once you lose your adult teeth, that’s it. You don’t grow new ones. That is why tooth loss is a big deal. So what causes tooth loss? Are your teeth going to fall out just because you don’t go to the dentist? Directly, no. Indirectly, yes definitely. What makes this true is an unforgiving little thing called periodontal disease. It’s an infection of the teeth, gums, and the bone that surrounds the teeth. Periodontal disease is the leading cause of tooth loss in adults. Nearly 80 percent of Americans have gum disease. Over time, bacteria in accumulated plaque deteriorates the gums, bone, and connective tissues until teeth actually fall out or must be removed. Red, swollen, and bleeding gums are signs of a problem and could indicate periodontal disease. However, this is a tricky monster because it can be symptomless in various stages, often going undetected. Periodontal probes and x-rays are required for the most thorough seek and find mission. At Dr. Jeffrey Allen’s family dental office, our hygienist will measure the depth of pockets between your teeth and gums. Anything deeper than three millimeters is a sign of periodontal disease. Our use of x-rays will show any recession of the jawbone, which further assesses the spread of the disease. 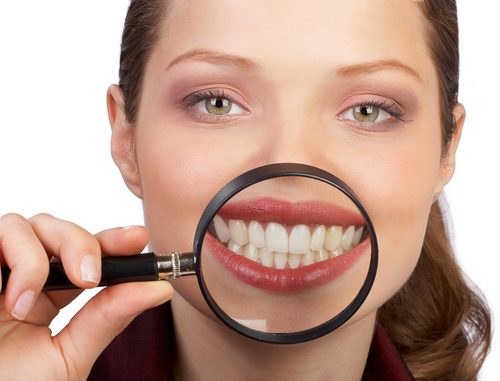 Diagnosis is key to preventing permanent damage and tooth loss caused by periodontal disease. We invite you to get a screening for this sly beast of a disease today. After all, you only have one adult set of teeth, and they are irreplaceable! At our dental office in Pella, Iowa, Dr. Jeffrey Allen provides comfortable dental care to patients of all ages. Call (641) 628-1121 today to schedule a checkup and cleaning, cosmetic consultation, or second-opinion visit. We are located on the west side of the historic town square in Pella. Please see the map for directions. In past generations, lasers were thought of as something in science fiction that you wouldn’t want to be in front of when fired up, let alone open wide for and smile. This may be why futuristic movies never make it into their own futures. They usually get it all wrong. As technology in today’s society continues to catapult us into new capabilities and efficiencies, the world of preventive dentistry has soared along with it. Laser technology is in a state of constant discovery. This has led to an advanced tooth decay detection called DIAGNOdent. Far from harmful, this laser is your best friend, unless you’re in hiding and your name is Decay. When the DIAGNOdent hand piece scans your teeth with its pulses of laser light, even the tiniest bit of decay or demineralization (the precursor to decay) is exposed as fluorescent feedback. Early detection and treatment will drastically decrease damage to your teeth, along with the precipitating treatments which tend to cost more. Before applying dental sealants, DIAGNOgent ensures that the teeth are 100% healthy and ready for the sealants. Prior to the ability to see under the surface of the tooth, decay could become trapped below sealants and cause issues to crop up further down the road. DIAGNOdent isn’t science fiction, nor is it one of those new laser technologies that need to be avoided until all the kinks are worked out. There are no kinks in this decay detection, other than outdated fears of lasers. Smiling for the lasers today will help your future smiles retain their healthy, natural teeth.